More than two weeks have come and gone since soccer fans around the globe were gifted the holiday present they never wanted: Qatar being awarded the 2022 World Cup. In a surprise vote that wasn’t quite as big a surprise to those who follow the oft-curious decisions made by FIFA, a country the size of Connecticut will host the pinnacle of soccer competition rather than the favored United States or Australia. Instead of resorting to name calling, let us consider what happened and why. Bigger is not better when it comes to hosting the World Cup, at least not in 2022. And if you’re willing to believe that FIFA selected Qatar for its merit rather than as a joke made by a bunch of guys who believe the 2012 prophecies then that World Cup will take place and FIFA wants it in Qatar. By holding the tournament in Qatar there will be no worries amongst fans or participating countries about travel arrangements during the competition, which is a good thing. Fans will be able to attend more games with less travel (once they are in country). And for those who worry about the safety of a Middle East World Cup should be encouraged by Qatar’s miniscule geographical footprint. There isn’t much room to roam or hide in Qatar. This could be one the biggest factor in Qatar winning the contest to host in 2022. As it stands, Qatar does not have the stadiums, transportation, or housing accommodations to host a 32-team tournament which will welcome 80,000 people just to work the competition. At this point – as far as the World Cup is concerned – Qatar is a small patch of land with some money (and Zinedine Zidane speaking on its behalf). It doesn’t take a genius to figure out the important part of this equation, either. Qatar absolutely has to spend tons of money to build everything the World Cup will need, and it was basically begging to do so. 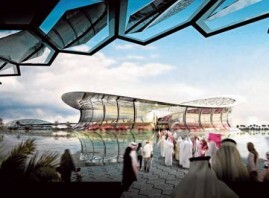 Over the next 12 years Qatar will build state-of-the-art stadiums, as well as – for those who know nothing of the architectural exploits of neighboring United Arab Emirates – otherworldly attractions for the world to marvel at. Qatar has to start from scratch, but will not skimp financially. How is it a bad thing to have nothing but new buildings hosting the World Cup? Red flag alert!!! There is one huge, waving red flag when it comes to playing summer soccer in Qatar: the heat. The average temperature in the capital city of Doha in June and July is a singeing 106 degrees (Fahrenheit, thank goodness). And if the air is that hot just imagine the temps of the scorched earth the matches will have to be played on… Well, since everyone acknowledged the heat index problem the second Qatar was announced as host it took a matter of days before FIFA began kicking around the idea of moving the tournament to winter. And if the tournament begins in January, for instance, clubs will try to disallow their players’ participation in the World Cup. Long story short: if the tournament takes place in the summer Qatar needs to remedy the heat issue and if it takes place in the winter clubs around the world will be a royal pain in FIFA’s rear end. People bitched about the United States being awarded the 1994 World Cup in 1988 because its national team hadn’t qualified for a tournament in almost 40 years. Qatar, meanwhile, has never qualified for a World Cup and has only advanced out of the group stage of the Asian Cup twice. On top of its lack of accomplishments, Qatar currently ranks 114th in the latest FIFA/Coca-Cola World Ranking (just ahead of Suriname and Tanzania). Qatar nearly qualified for the 1998 World Cup, but that doesn’t mean much at this point. The key here is that Qatar gets an automatic spot in the tournament ahead of a country which will surely be stronger by a wide, wide margin. It’s good for Qatar, but it is bad for the tournament itself, as well as the sport. As far as complaints about a World Cup go you have to consider this the minnow of problems, though. While many scoffed at the notion of Qatar hosting the World Cup there were a decent number of soccer fans who expected this selection. FIFA likes attention and it also enjoys – admirably so – spreading the game to new regions of the globe. Last summer it was Africa which hosted its first World Cup and in a dozen years it will be the Middle East’s first shot at hosting. A tiny country deserves a chance to host if it can do so and the world is likely to be rewarded with a tournament in a strangely magical setting. Even an American soccer fanatic can say without hesitation that there is something special about the idea of Qatar 2022 that the United States never could have provided. The big boys will get another chance to host, but the tournament is called the World Cup for a reason.